outside Ball Hall at ETSU. 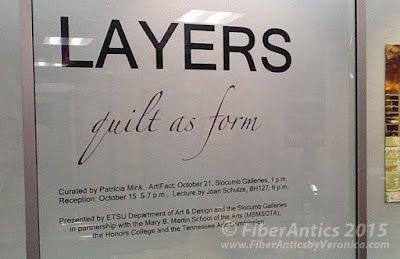 This past Thursday, I made a whirlwind four-hour drive from Knoxville to Johnson City and back to see the "Layers: Quilt as Form" exhibit at East Tennessee State University (ETSU). 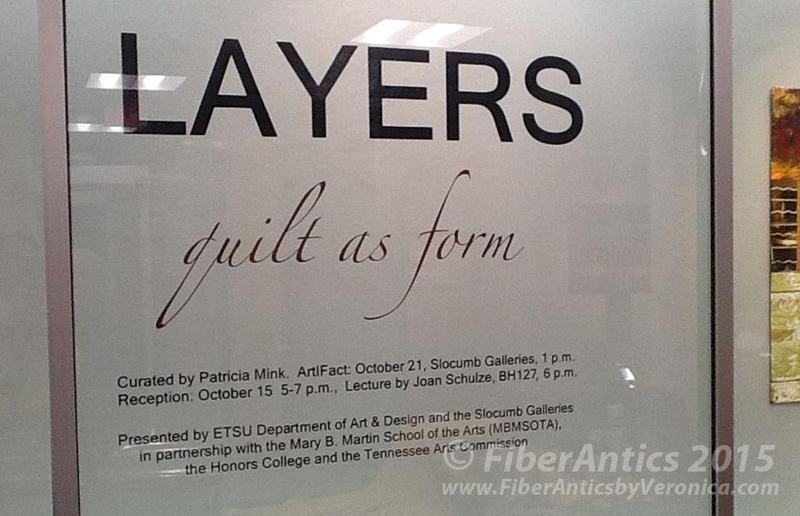 The exhibit (on display through October 30) was curated by Patricia Mink, the head of the Fibers Program at ETSU's Art and Design department. The impetus for me making this trip was to hear Joan Schulze present her lecture, "The Restless Explorer" at an evening reception on October 15. 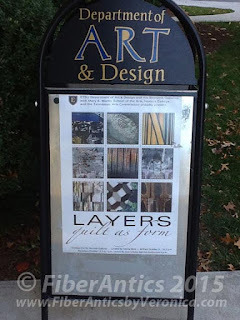 I took a workshop with Joan a few years ago at Shakerag that was fabulous. But once I tell you the full line-up of artists whose work is featured in this exhibit, your jaw will drop. I spoke with Pat Mink, the show's curator, at the reception and expressed my awe of the work and the caliber of the artists that were included in the exhibit. "I made my Wish List," she explained, "and they all said, "Yes!"" "Layers: quilt as form" exhibit. So, whose work is there? Let's start with internationally known pioneers of the studio art quilt movement, Nancy Crow, Michael James and Joan Schulze. 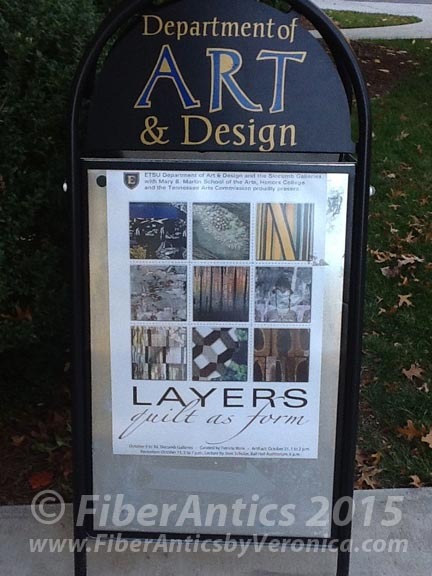 Contemporary fiber artists Susan Brandeis, Dorothy Caldwell and Judith Content have pieces in the exhibit. And work by regional emerging artists Jeana Kline and Aaron McIntosh is also included. If you are near the ETSU campus or can make a special trip this month, go and see this exhibit. The work is extraordinary and innovative. The digital technology juxtaposed with the hand techniques and hand stitching—while still reflecting on the traditional disciplines of stitched layers and quiltmaking—I found to be quite interesting and inspiring. 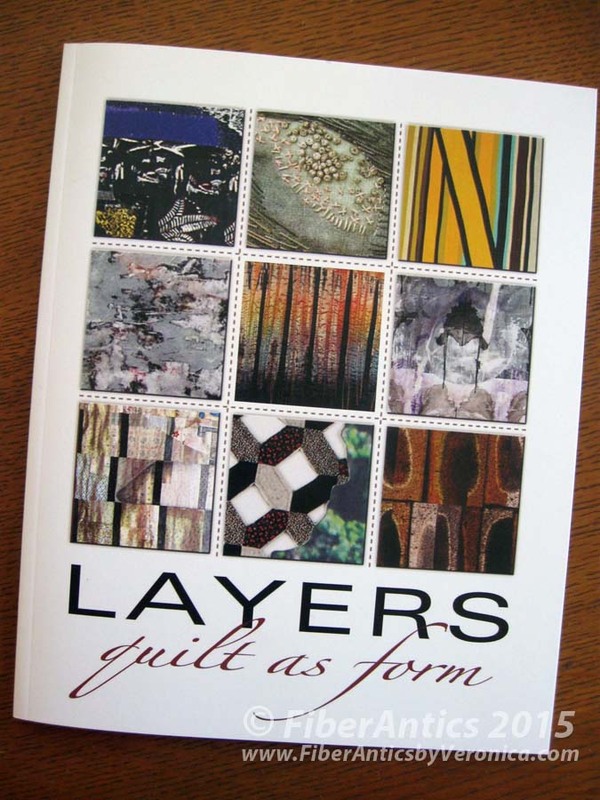 Limited edition program from the "Layers" exhibit. About her presentation, Joan Schulze says, "I put together what I think is an interesting presentation that reflects how I work, where my inspiration comes from, share a few poems and illustrate what motivates me to keep going into the studio." She adds, "Hopefully the audience will come along for the ride and take home something that may inform or inspire."